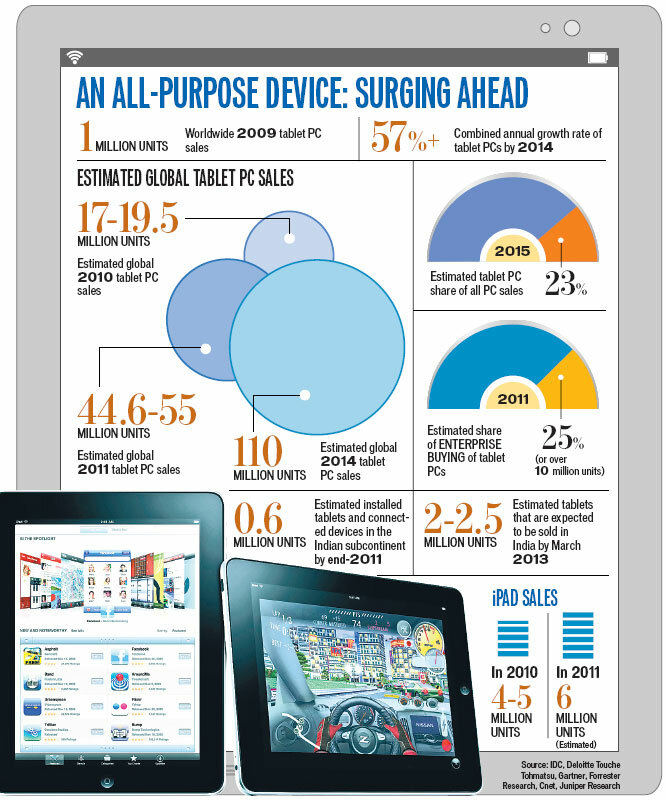 Tablets – the continuing growth! Global tablet demand will continue to surge in the next 4 years inspite of all the ongoing economic concerns shrouding most regions in the world. IDC expects tablet shipments to grow at a CAGR 25% over the next 4 years to cap 261 million units by 2016. IDC upped its forecasts for 2012 from 107 mln units to 117 mln units and its forecasts for 2013 from 142mln units to 166 mln units.Apple iPad will continue to dominate where as Android and Windows will expand the markets. Apple’s lead will slip, but only slightly, from 60 percent of the market this year to 58 percent by 2016. Soon to be released Apple’s 7” iPad will wrestle the low cost Android’s at the economy end of the market. Android’s share will also decline, from 35 percent this year to 30.5 percent in another four years. 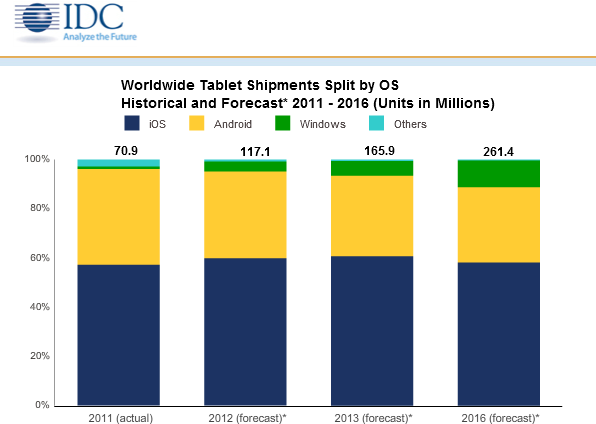 Windows Tablets will turn out 11% of the market in 2016 as against the 4% in 2012. 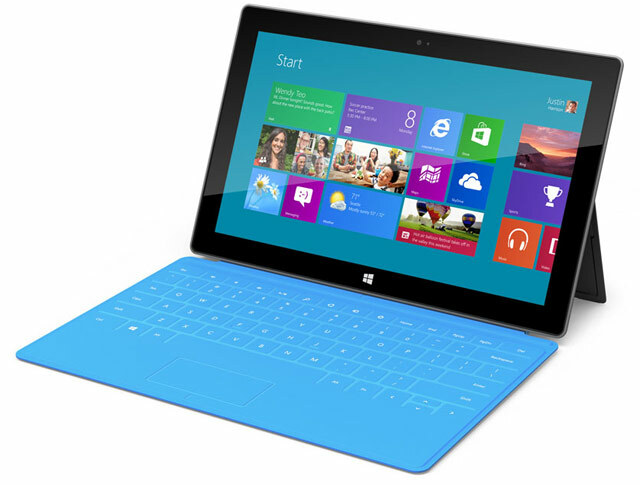 Cost is seen as a major stumbling block to Windows Tablets. However in times to come, Windows tablet will provide the requisite momentum to the tablet category as a whole especially in the enterprise segment. On the same note, iHS iSuppli has provided an estimate of 126.6 million units tablet shipments in 2012. That is a robust 56 percent annual increase in shipments for the tablet market in 2012, from 82.1 million units in 2011. Even while 59% sales will be from the 9.7” form factor (Growth in 9.7” segment is forecast to rise 35 percent from 55.2 million units in 2011), the fastest-growing portion of the market will the 7” screens tablets. n the seven-inch segment, which Apple is expected to enter later this year, sales are expected to nearly double from 20.8 million units last year. Microsoft Surface is remarked departure from Microsoft’s decades-old business model to sell OS licenses to companies like HP and Dell, and rely on them to make and sell the hardware. Yes,times have changed.The quintessential OS maker has now ventured into devices. More than anything this move is possibly Microsoft’s tribute to Steve Jobs. Apple has proven that the best computers — which rely on tight software integration more than ever before — are made when one company is in charge of designing both the hardware and the software, so they’re built in harmony and just work. Microsoft seems to have figured this out, too, via the Xbox and now this Surface tablet. That’s why the Surface is able to ship with a cool cover with a built-in keyboard. Such integration couldnot have been left to any other ODM. Microsoft has also learned that the best business model in today’s mobile industry — tablets and smartphones — is to the sell the actual hardware to consumers, not just license an operating system. Given today’s economics, the only way to potentially earn a profit of more than $100 per tablet is to sell the actual tablet. There’s no way Microsoft could earn that just selling Windows licenses to HP. Especially as it’s primarily competing with Android, which is sort-of free. Will this thing be a hit and make Microsoft a lot of money? Enough to compensate for any potential decline in the Windows-for-PC business? Who knows. Would people opt for a Windows Surface in the face of a higely popular iPad. Perhaps some will, especially if they think Office means something to them. But I expect the iPad to continue its dominance of the tablet industry. But it sure looks like a better strategy for Microsoft than only trusting the Samsungs of the world to design great Windows tablets, and only trying to generate mobile revenue from Windows sales. Sure, Microsoft may now alienate some of its Windows partners by competing with them. But as those partners have gone into the mobile industry, they’ve already strayed from Windows to Android, anyway. Windows8 is already a great option for Android ODMs given the Google-Moto acquisition. Plus, competition or not, as long as Dell wants to make PCs, it’s not like it has any real OS alternatives to Windows. Microsoft is unquestionably late to this market, though it didn’t intend to be. But the interesting thing is that Microsoft is evolving with the times, both in terms of product design and business model. It may fail, but it’s at least learning to play the right game. Does Apple need a 7″ iPad? iPad has been the the force-majuere in the Tablet segment and has held strong against the multiple Androids and a one -off RIM Playbook as well. However in Q4, 2011, it was Amazon Kindle Fire Tablet launched the most credible counter offensive to Apple iPad monopoly. Not only did Amazon Kindle Fire impact Android numbers positively by selling 4.8 million units in the holiday season, but it has caused a pause and re-think in Apple on the feasibility of low cost 7″ Tablets. There are rumours about a 7″ iPad from Apple now. Now then, does Apple really require a 7″ iPad? 1. Apple may have burnt its hands and gone on the path of bankruptcy by not choosing to go with the cheaper computer in the early 80s. So there is meat in the arguement that no segment be left out. A stripped down iPad could fire up sales at low margins for Apple. 2. Apple could also block Android more effectively in Tablets – one of the hottest device domains in the future. 3. Apple could also increase its user base and graduate more users too its unmatched content eco-system and hope to make more gross money out of it. 1. 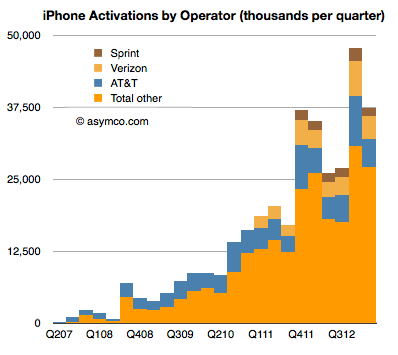 Does Apple needs volumes? Its exclusivity has been its USP and its profit/revenue/earnings per unit has been the stand out even as Google/Android have generally failed in terms of moentizing their services effectively. Apple has also historically avoided playing the volume game, preferring instead to have a niche market following while cornering most of the industry profits. Even in the mobile phone business, where its iPhones are selling like hotcakes, its global market share is in single digits but it takes up more than three-fourths of the industry’s profits because of its high margins. 2. The Tablet market is far from mature and a carefully positioned mid end ($300?) 9.7″ earlier generation iPad2 could possibly be a better solution not only in terms of bocking Amazon and Android but also gathering volumes. Carriers would give their left arm, right arm and more for a data machine like the iPad on reduced prices in their network. This strategy could meet the demand for the low-cost tablets to a good extent without having to develop a smaller tablet. 3. A cheaper 7-inch tablet appeals to a different segment of population that includes mostly price-conscious consumers. The entry of the Kindle Fire has lowered the cost barrier and will pave the way for new consumers entering the tablet market. This will serve to whet consumer appetite for tablets and may even make customers shift to a costlier tablet such as the iPad for their future purchases. 4. Finally then, the iPad with its 9.7″ screen defined the Media tablet space – a tablet which is broadly based on media usage which is in concurrence with Apple’s long term strategy around media – photos, songs, videos, books. Its widespread adoption led to trends such as BYOD enterprise use. Essentially, the iPad was first a media machine and secondly a mobility device. 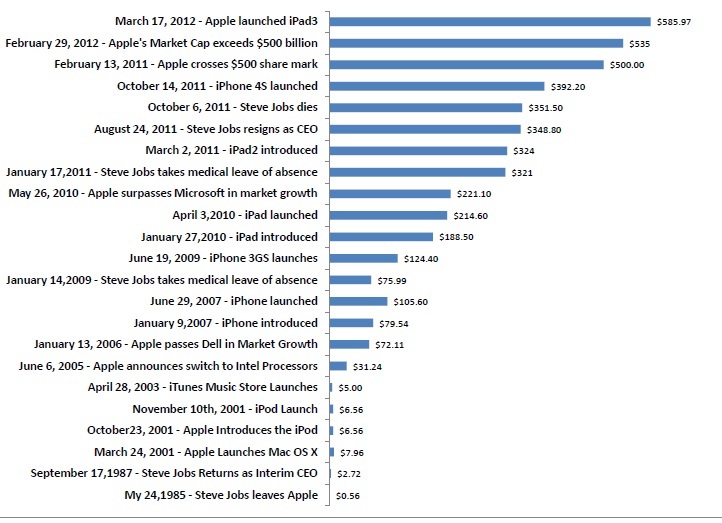 That is the way Steve Jobs defined the tablets: he ranted the 7″ tabs were dead on arrival. Considering the 7 factors listed above, i do think that a 7″ iPad doesnot cut ice for Apple . A low cost 9.7″ iPad (still at a premium from the market) is better. 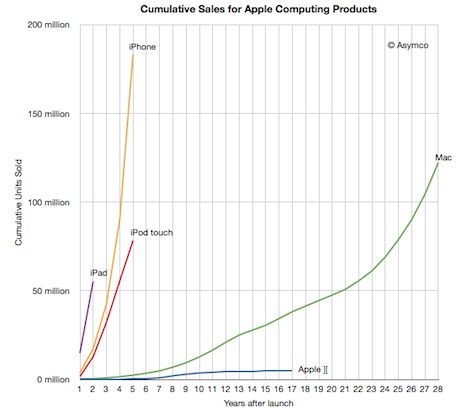 But for the record, i will go wth the late Steve Jobs – Mobility is for smartphones. Tablets are a different breed…. 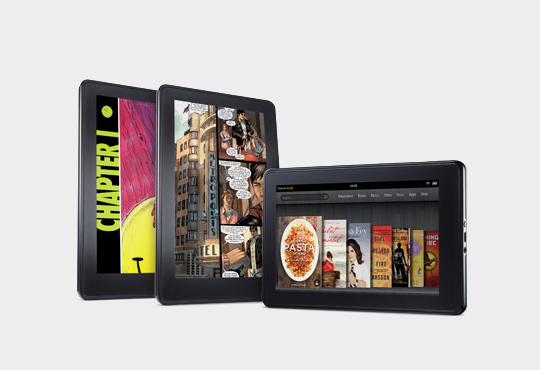 Amazon Kindle “fires” up the tablet market! The $199 pricing from Amazon, is one of the best examples of penetrative pricing- where by Amazon can make more money later by selling books, movies, music, apps through its app store. The reason Amazon can do it is because it has an offering very similar to Apple where it’s controlling the device, platform (it has a modified version of Android) and app store. Hence, it’s looking at a long term revenue by following a penetration pricing strategy. In doing so, it’s also utilizing its existing capacity of billions of gigabytes of cloud storage combined with Amazon Silk interface for faster loading of webpages to provide a better user experience.The reason other tablet players in the market such as Samsung, HTC, Motorola among others can’t follow this strategy, with the exception of apple, is because they only control the device part and have very little control over Android platform (controlled by Google) or app store (again influenced by Google). On the flip side, Kindle Fire isn’t proper Android tablet. It is a forked version which means, whatever updates Google does will not make it to the Fire. It will Amazon’s prerogative to get the updates. Even the Android Market is out of bounds on the Kindle Fire. What really is unexplainable is the absence of HSPA capabilities on the tablet. Is it cost? For a mobile device which is heavily dependent on anytime available cloud service, not having a innate mobile connection capability is befuddling. And then there is the lack of Camera? Surely That wasn’t a huge investment that Amazon opted out of. It was hygiene. Kindle Fire has shown us that a successful tablet launch isn’t all about the greatest hardware. It’s the apps and the ecosystem. Without which the brightest of the tablets are destined to fail. And don’t make the mistake of considering this a success for Android tablets. Because it is not. This is a tablet which only an Amazon could have pulled of. In fact Kindle Fire would be a nemesis of Android tablets. Now they have to compete with both iPad and Kindle Fire – one at the top end and one and the lower end of the spectrum. Amazon has done a brilliant job of picking its niche and playing to its strength – content: gaming, video, music or eBooks and build an ecosystem around it and then start selling. That in essence is the purpose and motto of tablets- Tablet happens to be a conduit to digital consumption. And Amazon has seems to have hit the nail quite on its head. 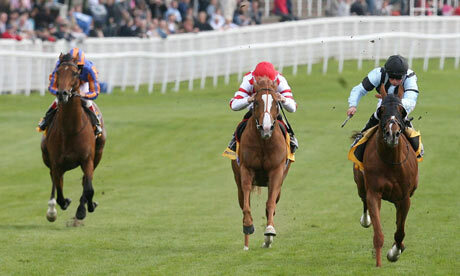 Tablets: Is it a two horse race? Or there are three horses? Gartner estimates that tablets were a 17.6 million market in 2010 and are expected to be 63.6 million units strong in 2011.That is an incredible 261.4% growth. The growth figure is expected to touch 326.6 million units by 2015 according to Gartner.ISuppli puts the 2015 number at 275 million units. Gartner had reduced its forecast for growth in computers sales from 9.3 per cent to 3.2 percent in 2011 and from 12.8 per cent to 10.9 per cent in 2012. This dominance and takeover of the computing world by tablets has so long been good news only to Apple even as Android struggles to get better at the tablet game. iPad 2 single handedly outselling all competing tablets combined and is expected to account for 73.4 per cent of worldwide tablet sales in 2011, down from 83 per cent share in 2010. Gartner expects Apple to maintain 50% of the global tablet marketshare in 2015.. Android tablets are on pace to ship 11 million units in 2011, accounting for 17.3 per cent share in the market up from 14.3 percent market share in 2010. Gartner’s forecast for the Android has been lowered by 28 per cent from last quarter’s projection. The reduction would have been greater had it not been for the success of budget tablets in Asia, and the expectations around the launch of Amazon’s tablet. To many, the third front would be the Microsoft Windows tablets which aren’t yet there on the horizon (not yet! ).And yet, late arrival might limit its appeal, especially to consumers, as Apple and Android will be well established in the market by then. The current buzz around Windows 8 driven by the demonstrations seen at the BUILD conference might be short-lived if Microsoft’s push to use the new OS across devices comes at a compromise in usability. Also, the late arrival might limit its appeal, especially to consumers, as Apple and Android will be well established in the market by then. Media tablet shipments grew at a solid pace in the second quarter, led by continued strong demand for Apple products. 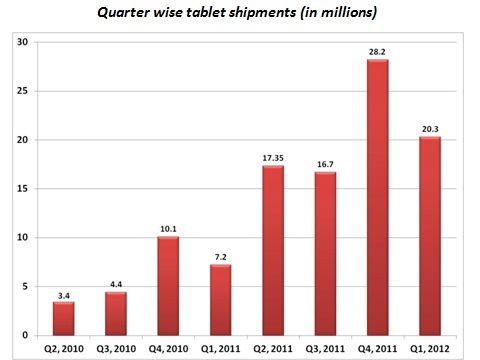 The growth in tablet shipments through Q2, 2011 continues unabated as shipments rose by 88.9 percent between the first and second quarters, or 303.8 percent year-over-year. Apple continued its stranglehold of the global tablet shipments by uping its market share from 65.7% in Q1, 2011 to 68.3% in Q2, 2011.RIM which entered the market during the second quarter with the BB Playbook cornered 4.9% of the market share and most of this gain was at the cost of Android tablets. Android tablets, which previously held 34 percent of the market during the first quarter of the year, fell to 26.8 percent in the second quarter. Android which is ruling the smartphone charts is expected to loose a little more in Q3, 2011 due to the $99 HP Touchpad numbers. 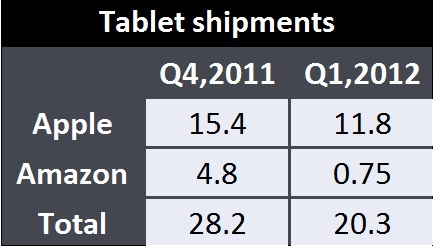 HP in the mean time is expected to do a 4.7% cameo in Tablet market shares in Q3,2011 before going out of the tablet markets altogether. Even if a recovery for Android’s is sighted in Q4,2011, Apple will hold on to a 40% delta/differential share between itself and Android. However, what looks increasingly possible is the emergence of a third competitor to iPad dominance and its is expected that Windows 8 powered devices could take this position to themselves. The case for QNX powered Playbooks doesnt look strong and HP Touchpad will exit in Q4, 2011 giving Microsoft an opening of 10% market share if the WP OEMs are able to leverage Microsoft’s superior platform, robust OS, enterprise back-integration and the MS eco-system to market their devices best. 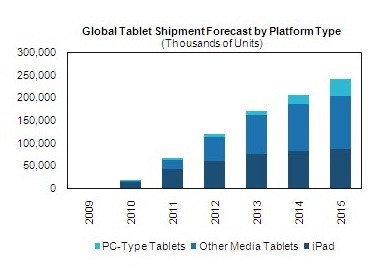 The tablet markets are still on their ascendance and the size of the pie is growing. Apple seems to have taken a pole position in terms of its exclusivity, unmatched user experience and its ability to connect through the alll other Apple devices. Android’s look increasingly like they would own up the consumer segment and would keep penetrating lower in terms of reach and pricing and thus the massification of the Android tablet. The WP tablet could take the enterprise leverage which Windows anyways has and would backward integrate with the legacy systems which thus could be a very strong position. By March 2013, Deloitte expects that worldwide, 35% of the overall tablet PC base of around 100 million units will be delivered by iPhones, 40% by Android-based tablets, 15% by Windows-based tablets and the remaining by other technologies.